When Mac Brennan wakes up in a dumpster the only thing that he can remember about himself is his name. It also doesn't help that he's naked as the day he was born and that his left arm is covered in a black tar like substance which seems to turn red when he is in peril. Mac knows that there's something he needs to accomplish and that time is running out but he has no idea what that might possibly be. Before Mac has a chance to even remotely figure any of this all out, he finds that he has angered a werewolf and that they are out for blood. For someone who supposedly is the good guy, Mac has a funny way of showing it. In an effort to save a woman he barely knows, he throws another off of a building. Sure, she might survive the fall being a werewolf but he doesn't know that. Then there's the whole, let's not kill the bad guy because a kid might see, even though he knows that the guy will probably heal and hurt him. It was all ruse for Cipriano to include yet another fight scene in this book. If Cipriano really wanted me to believe the whole heart of gold shtick, he should have developed Mac's character a little bit. LGBT people and the disabled had the good fortune of not being included in Cursed; however, people of colour didn't fare as well. The first person of colour we meet is Jack and Mac actually refers to him as the Indian on several occasions. It takes a few pages for Cipriano to decide to give Jack a name, as though there's nothing problematic about a white man referring to a man of colour simply by his race. Then we meet Loraine, who just happens to be Jack's ex because Cipriano loves his ridiculous coincidences. Things don't end well for Loraine and she finds herself thrown off a building but not before being overly sexualised by Mac. Thanks for that Cipriano. The last person of colour is the antagonist who is an Asian cursed. The antagonist is just as blank as Mac but it does present a problem because it turns Mac into the heroic white dude saving a White woman and a White child from the evil Asian man. Yeah, the racial implications here are awful. 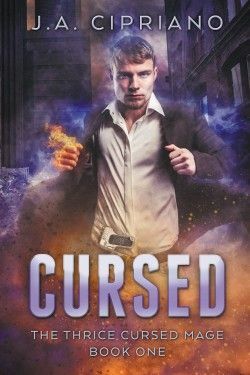 The only thing going for Cursed is that it's a fast read if you can get through the ridiculous referencing to Lord of the Rings, DC Comics, Marvel Comics, Die Hard (Trust me, Mac is no John McClane) etc,. as well as the fact that this book is nothing more than one drawn out fight scene with ridiculous coincidences thrown in to make this already implausible plot all the more ridiculous. Cipriano basically threw things at the wall desperate for something to stick and unfortunately all he created was a heaping mass of awful. I don't know how I made it through this book but I want a big fat cookie.